We aim to be a trusted company through the protection of human rights and compliance with laws and regulations, and by respecting public decency. To enhance the overall compliance of our Group, the Corporate Planning Committee—headed by the Corporate Planning Headquarters General Manager—sets and reviews compliance policies on a regular basis. Based on our internal rules and the Aichi Steel Group Action Guidelines, we strive to improve our compliance with laws and regulations as well as our social common sense. We enhance employee awareness by distributing compliance manuals, and the Aichi Steel Group Action Guidelines. To enhance the compliance awareness of employees, we provide education on compliance to all employees. The importance of compliance is also covered in the Action Guidelines workshop held for those promoted to each level within the organization. 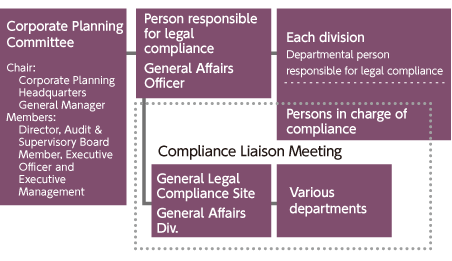 In addition, other corporate scandal case studies are reported to the Compliance Liaison Meeting to help prevent the recurrence of similar compliance incidents. We also hold director workshops on director responsibilities, and CSR seminars on confidentiality management and corporate scandals. 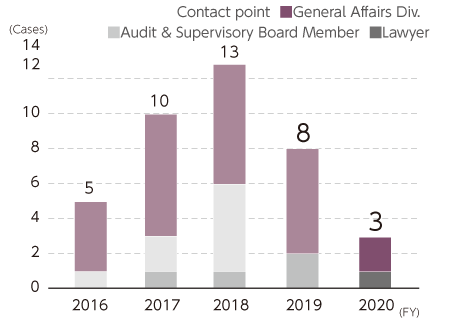 In fiscal 2017, a total of 10 cases were reported to the Aichi Steel Group Compliance Hotline, the company's whistle-blowing system. We will continue promoting recognition and awareness of our whistle-blowing system to further improve our internal ability to govern ourselves. Necessary measures will be taken for improper actions reported, and the president will be informed to the president for confirmation while such measures are carried out. We will also lay out how the system is operated and protection of whistle-blowers to ensure whistle-blowers are protected. In fiscal 2017, there were no complaints or comments concerning intellectual property. We periodically hold Business Regulations, Procurement Edition seminars to improve compliance with the Subcontracting Act, which is closely connected to our procurement transactions, and to avoid breaches of the act that is easy to fall foul of.